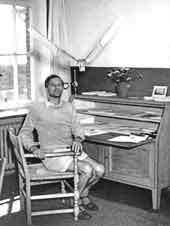 Erich v. Holst (1908-1962) researched on biological and aerodynamic problems of animal flight. In interplay between creative flying models, many experiments and consequentially thoughts he reached new perceptions about the flapping flight. Thereby a main focus of his work was on the determination of force distributions along the wing on up and downstroke. These conceptions of the aerodynamics and flight mechanics of flapping flight were the basis for his new wing designs with the corresponding drive mecha­nisms. Each of his flapping wing models was equipped with an especially for this designed rubber motor. This is the original image with unequal cycle times. It would be the ideal situation for the bird when during the downstroke of the wing the arm section and during the upstroke the hand section was missing. You can make it plausible if you imagine, the wing area would be reduced and could slip along the longitudinal axis of the wing. 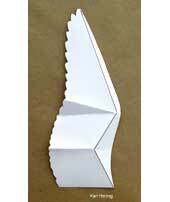 It would then be shifted to the wing tip on the top of the stroke and to the wing root on the bottom point. In this way, seen over a whole flapping period, while maintaining the normal force Q (or the lift) the thrust S gets larger than the backward directed force R. This ingenious trick of nature solves the mystery of bird flight. The fact that one can even recover the lost energy associated with the rearward directed drive R and use it again (see The principle of flight) was not yet known at that time. 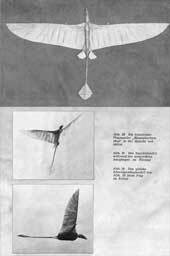 This view of the flapping flight by E. v. Holst - with his combination of theory and practice - has strongly influenced the development of my EV ornithopter models shown here. 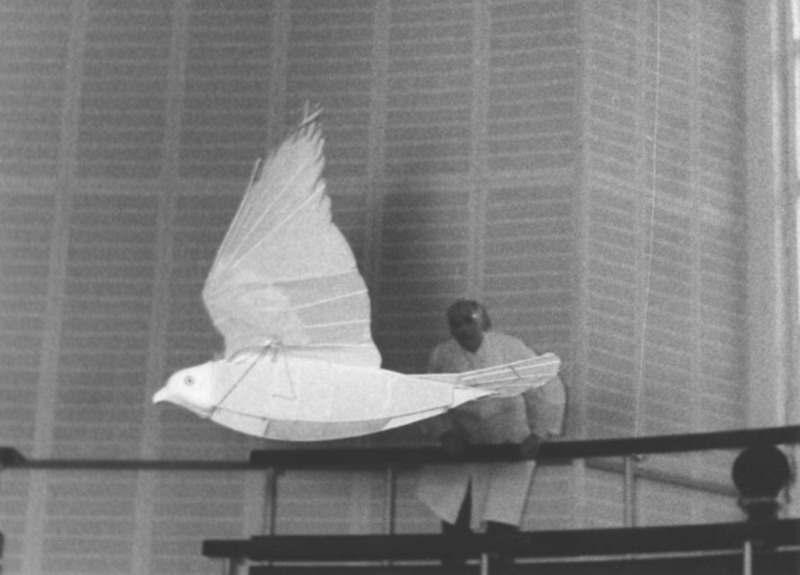 There is film footage with sequences in slow motion of some flapping wing models by E. v. Holst in the 1940's. It can be seen the large model Swan and the model of a Brimstone Butterfly in flight. Furthermore there is shown his Thrust-Wing with its rotating flapping wings - an inspiration from the flight of Dragonfly. The video is an excerpt from the film Wings Over the World . Erich v. Holst, Tierflug und Modellflug. Animated pictures of a slow motion film from this article. 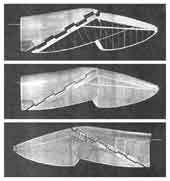 One can see the rise off ground of a rubber-powered ornithopter and particularly the changing of the angle of incidence at the wing root recommended by Erich von Holst. 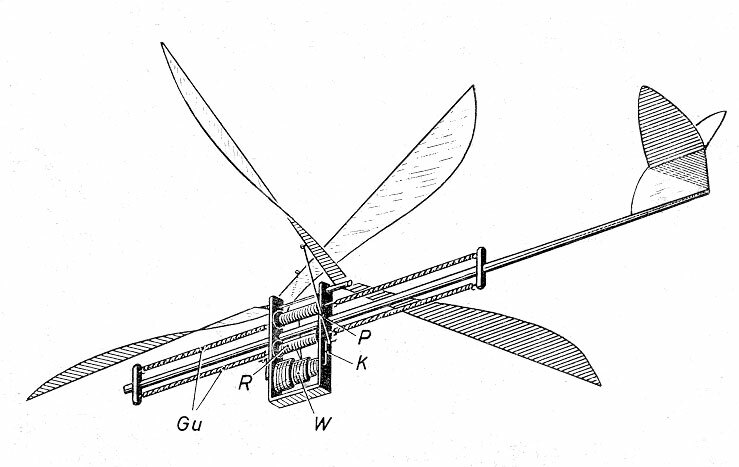 The rubber powered crank drive with a filament gear, developed by Prof. E. v. Holst, generates the stroke and twist motions of the wing at the same time. Thereto, the linkage coming from the crank pin is rotable mounted only in stroke direction at the spar of the flapping wing, but in rotating direction torsion-resistant. Thereby, the up and down motion of the crank pin is used to drive the stroke motion of the spar. At the same time the back and forward motion of the crank pin is used for rotating the spar. Furthermore, the spar is torsion-resistant connected with only one of the outer ribs (Ri). Thus, the crank mechanism actively effects the twisting of the flapping wing. Stroke and rotating motion of the wing spars are phase-delayed by 90 degrees. You can find descriptions of several rubber motors in the articles by Karl Herzog (in German) of March und April 1963 below. A great admirer of E. v. Holst was the academic painter and university painter Karl Herzog from Tübingen. 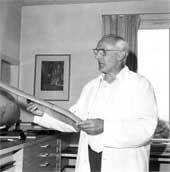 In general he has done a very great service to the documentation of Erich von Holst's models. 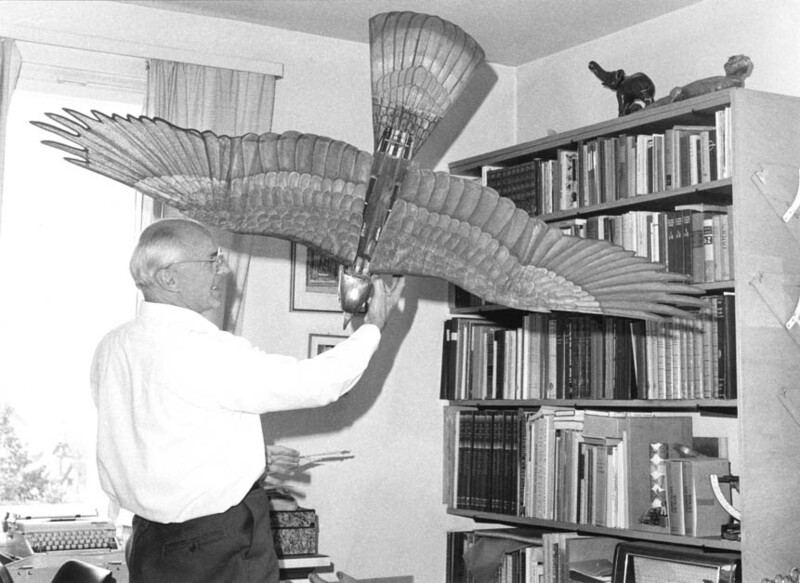 Mr. Herzog also has drawn and built his own bird models according to the models of E. v. Holst and has been busy intensively with the flight of birds. Karl Herzog has been my pen friend over many years. Among other things he drew and described there how the models by E. v. Holst can be built. Below, these articles are available separately in PDF-format (all in German). But there is also a compilation (PDF 9.0 MB) of all articles. Of these series there is also an old abbreviated English version (PDF 2.4 MB) with partly different pictures. It was also translated in the Netherlands (PDF 1.2 MB) by Louis van Telgen. This issue contains the specification of the flapping wing model Buzzard . 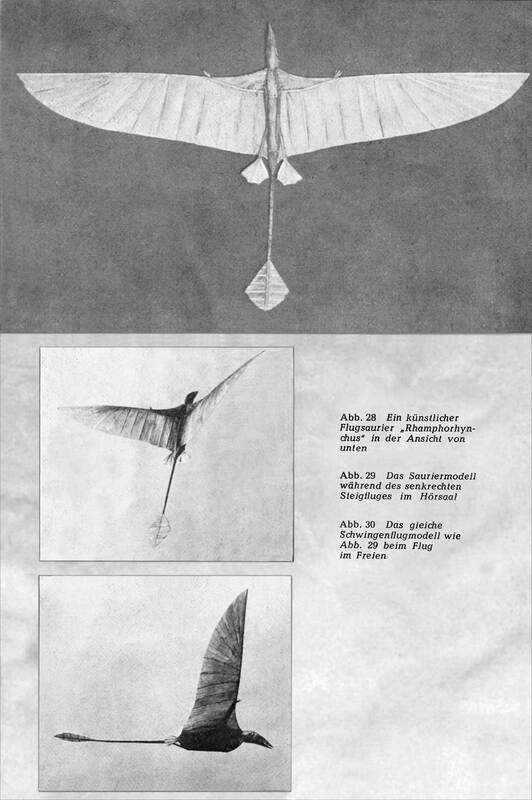 This is the plan of the flapping wing model Swan by E. v. Holst, drawn by K. Herzog. There is also a video of the Swan (look above). This edition consists the specification of the model Swan and the plan of the model Buzzard . 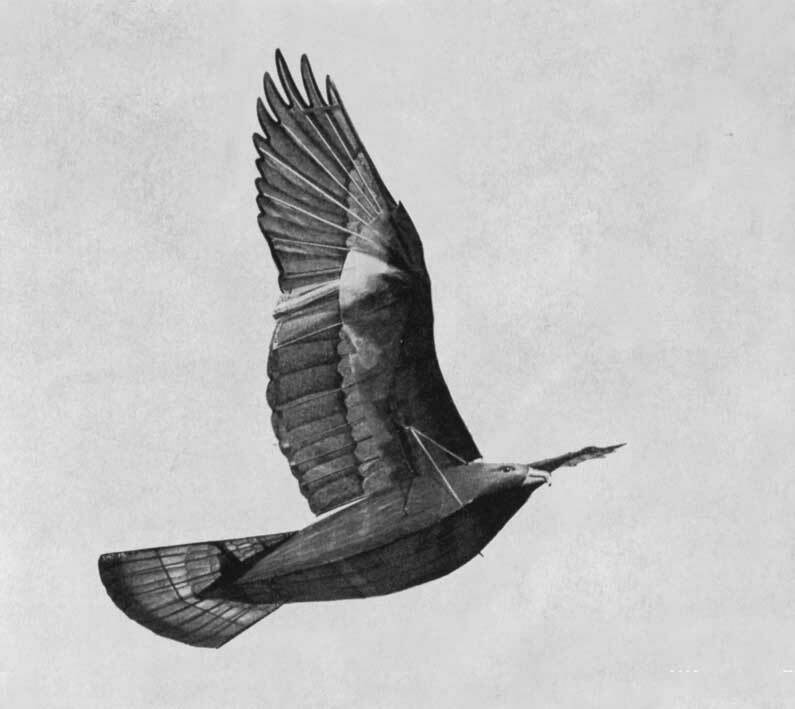 Here is a design study of flapping wings by Karl Herzog. At the version A and B the axis of the hand wing runs obliquely in relation to the flight direction, like on birds. 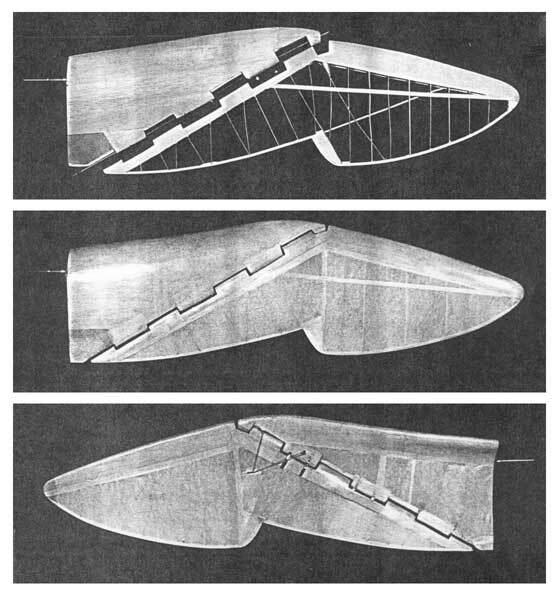 Other designers of flapping wings mostly aligned it parallel to the longitudinal axis of the wing (like version C). with one of his model wings. 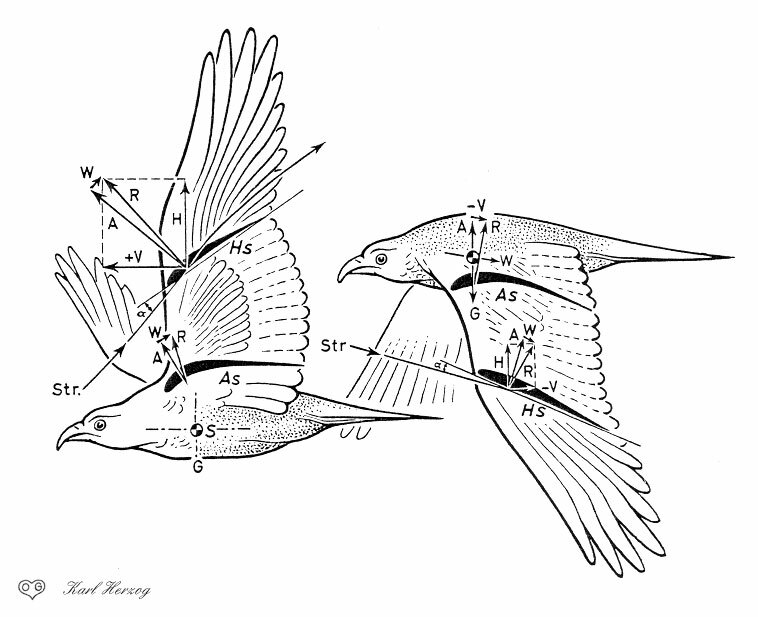 Here the plan of the flapping wing model Buzzard by E. v. Holst, drawn by K. Herzog. of an old slow motion film (by Erich von Holst: Über künstliche Vögel als Mittel zum Studium des Vogelflugs. Journal für Ornithologie, Band 91, 1943). The animation shows a climb flight of the artificial bird of about 30 deg and a flapping period of 2.5 per second. There is to seen the small rotation of the wing root and the wing twisting. The model has had a crank drive mechanism according to the crank by E. v. Holst and the relevant drawings by Karl Herzog (see above). This is an airworthy bird model of type Rook with a paperboard construction. 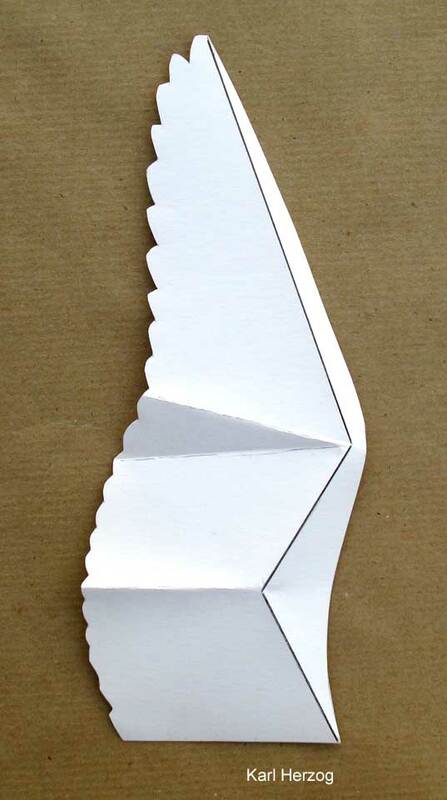 The 3D-form of this folded paper wing by Karl Herzog based on that of bird wings. It may be helpful in describing the changes in airfoil camber and angle of attack at the elbow when the biological wing is stretched or contracted. Today, the Aue-Verlag, Möckmühl, Germany, owns the copyright of this series by Karl Herzog. Text and drawings may not be published elsewhere. Later Karl Herzog has written the book Anatomie und Flugbiologie der Vögel , published 1968. At the pages 136 to 168 it contains the chapter Demonstration of the animal flight on the basis of bird models and flapping flight gadgets . Regrettably the book is not available today. Here the bird model No. 21 Buzzard , with rubber motor, designed and drawn by Karl Herzog. 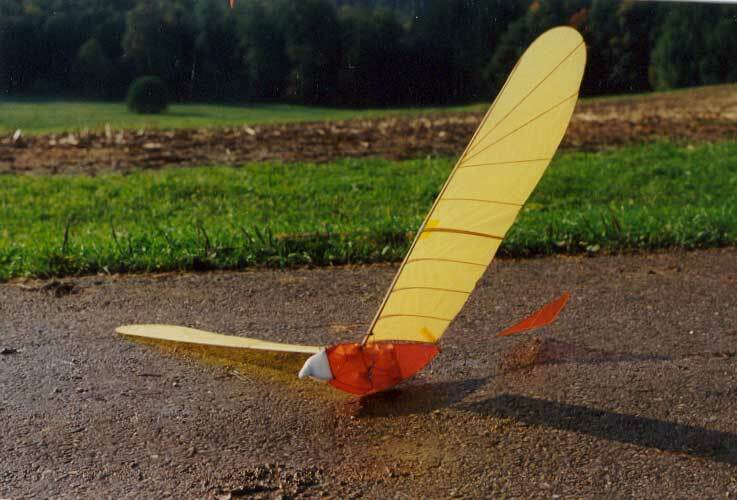 This is his bird model Golden Eagle powered by a rubber motor in flight. 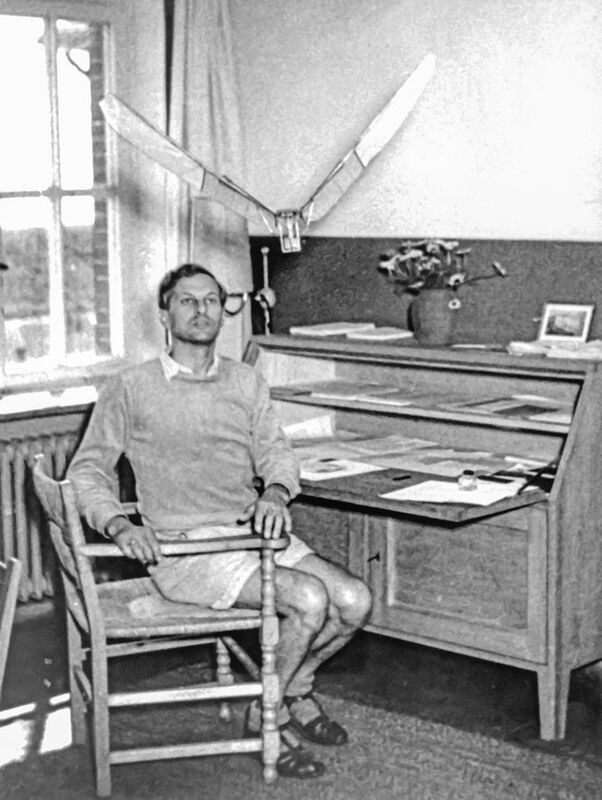 Furthermore he has written a treatise (in German) about the Phylogenetic development of dispersibility by birds a chronological listing of the developments of flying models and much more (partly unpublished). Herzog has also played an important part in the design of the permanent exhibition Flight in nature in the Deutsches Museum in Munich. Demonstration model with an active arm wing twisting by a pitching motion of the spare, built 1985 by suggestion and plans of Karl Herzog. 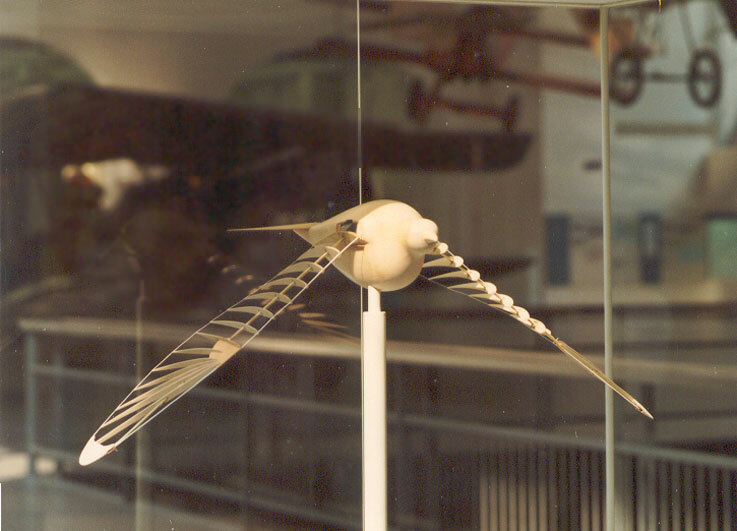 which is shown in the show case, to show the stroke- and twisting motions of the wings during the flapping flight of birds. for demonstrating the folding of the bird's wing. Karl Herzog has found that in birds in the state of a stretched wing the tendons and bands of the wing are tensioned in such a way, that the wing twist is set for gliding or sailing (please look at his book Anatomie und Flugbiologie der Vögel, published 1968, page 43). Muscle force for setting the correct wing twist, therefore, is not necessary, but only for stretching of the. It is caused in particular by muscles of the inner wing. This was probably also the case with flysaurs. Birds stabilized the angle of attack along the entire wing with feathers that are torsion resistant fixed to the bones. For this purpose, predators had in particular the flight finger at their disposition. They also used it to control the tensile stress of the wing membrane. For this they probably had a similar stretching and twisting mechanism as birds do today. According to this, in pterosaurs with an outstretched wing and without approaching flow, the wing tips were bent relatively far downwards on the outside and the angle of incidence along the entire span was large. When inflowing with glide velocity, suitable profile cambers and the appropriate angles of attack then aeroelastically have been adjusted by itself with the aid of the actinofibrils. 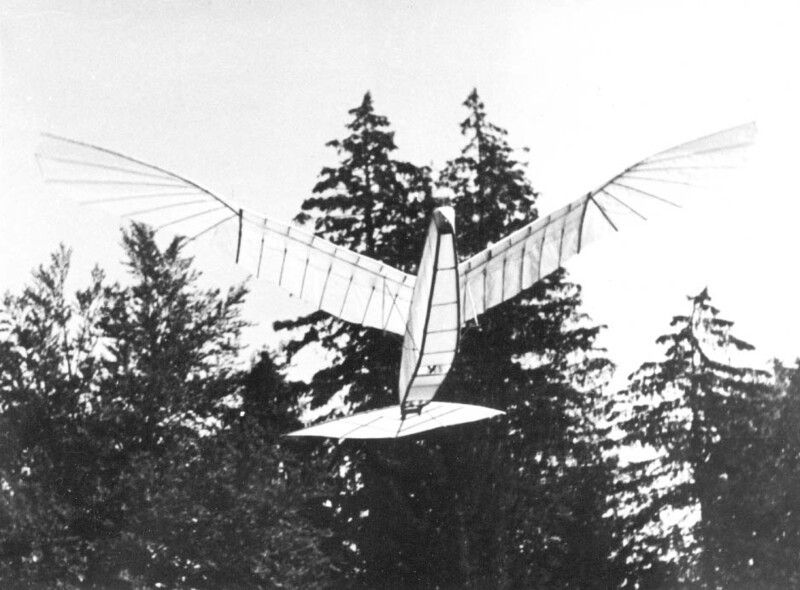 At the same time, the lift raised the wing up to the position of gliding flight. 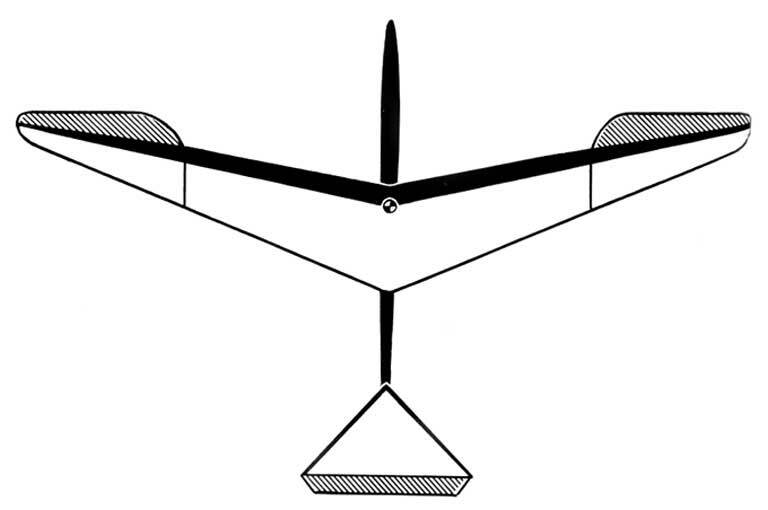 Based on this, the correct profile camber, the correct angle of attack and a suitable wing shape have been aeroelastically adjusted also during downstroke, with its outward shifted lift. 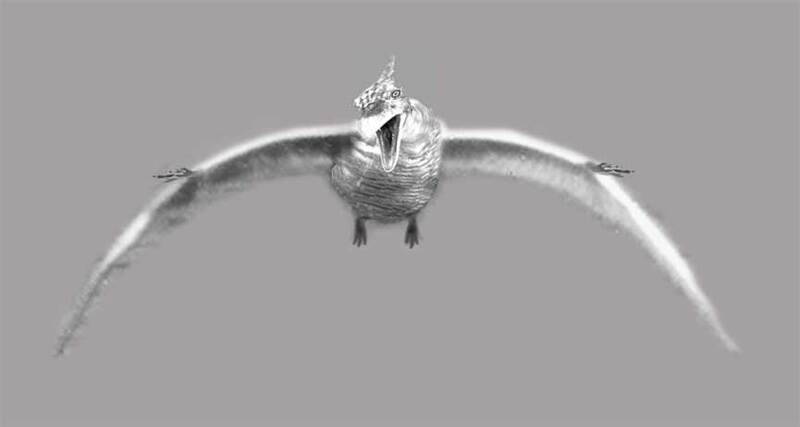 The picture is adapted from the flight image of a swan from ahead, during wing upstroke. In order to use this automatism also during upstroke, the trailing edge of the wing membrane must always be tightly tensioned. Only in this way can be developed sufficient lift, especially in the inner wing (see picture). A backward bending of the outer dinosaur wing, as in birds, is therefore very unlikely. On the other hand, a downward bending would have a positive effect on the pulling direction of the trailing edge of the wing membrane. In addition, in order to support the shifting of lift or thrust generation, also for pterosaurs a nodding motion of the body comes into consideration (please look at chapter 6., Lift during wing upstroke, version 10.0, 2015 - 2018, PDF 1.0 MB). This increases the angle of attack on the inner wing during upstroke. 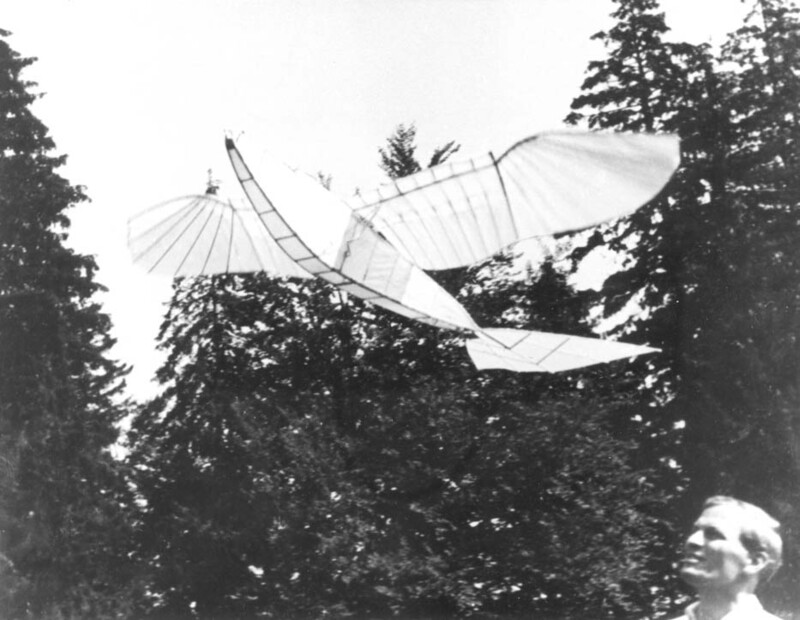 It is certainly very demanding to build an ornithopter with such a flight technique (see replica of a pterosaurs - a Quetzalcoatlus Northropi, by Paul MacCready).